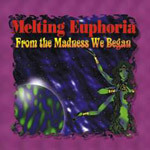 Melting Euphoria - "From The Madness We Began"
Though the title is new, this is NOT a new Melting Euphoria album. Rather, it's a reissue of the first Melting Euphoria album, originally titled Through the Strands of Time, which was released in 1994, and also includes some very interesting historical bonus tracks. Unlike subsequent Melting Euphoria albums which were released by Cleopatra, Through the Strands of Time was self-released by the band and didn't receive nearly the kind of distribution that the Cleopatra discs did. Also different about this album was that along with mainstays Mychael Merrill and Anthony Budziszewski was keyboardist Don Falcone, who left the band before the CD was even released, and later replaced by Luis "Zero" Davila. The genesis of the space rock style heard on the Cleopatra albums is very much in evidence on these tracks, with Anthony's trademark deep thudding cosmic bass and Mychael's powerful drumming. Don's keyboards bring varied space-prog elements to the mix, and his thoughtful and sometimes intense spoken word vocals are the one main difference, though there's also a floating space-ambient vibe on some of the tracks that bear Don's mark. Among the handful of long lived 80's-90's American space rock bands, Melting Euphoria was probably closest in sound to Architectural Metaphor, though each band had their own distinct characteristics. Melting Euphoria was very much a band for fans of heavy driving space rock in the Hawkwind and cosmically inclined progressive rock realm. And on this album Don's poetic delivery definitely begs comparisons to Robert Calvert era Hawkwind. Great stuff and not to be missed if Through the Strands of Time never made it into your collection. And… AND… we've got 3 bonus tracks of pre-Melting Euphoria bands. Two of the tracks are by Red Gypsy Rain, a band that included Don on keyboards and vocals and Anthony on bass, plus Matt Hart on guitar and Carter Lott on drums. "One Spirit Burning" features powerful tribal drumming, ripping rock guitar, progressive inspired keyboards and Anthony's bass, which even then was very much a chest thudding force to be reckoned with. Overall I'd call this progressive rock, though there are space rock elements and a cosmic vibe to be sure. "Dreaming Synapses" is another very cool prog tune, this one with a more overt 70's sound, and transitioning into a number of different thematic directions, and Don colors the proceedings with some nifty alien space electronics. Myrth was a band that included Mychael Merrill on drums, along with Elsa Golden on vocals, bass and guitar, Dan Miller on guitar and Brad Steffen on keyboards and vocals. "Happily Ever After" is the only Myrth track of the set, it being a folk based progressive song… a little medieval, a wee bit psychedelic. Very nice. NOTE: From The Madness We Began is not available at the time of this writing (September 2006). Mellow Records is quoting a yet to be specified date in 2007. But with the Don Falcone interview appearing this issue it seemed appropriate to review it. (Plus I wanted to get you all fired up and bothering Mellow to get it out.) And for those of you who don't already know, Mychael Merrill died of cancer on July 7, 2006, though his spirit is much in evidence on two new Spirits Burning releases, which you can read about this issue. For lots of details about the origins of Melting Euphoria CLICK HERE to read the interview with Don Falcone that appears in this issue.